Meditation might conjure up magical, mystical images, but basically it's a practice that brings great personal benefit in the form of better awareness, understanding, energy, health and general well being. It harnesses the deep beauty of the inner self, empowering our self confidence, and helps us make sense of our lives. 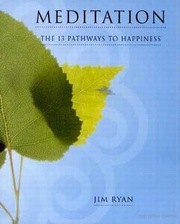 Written in a clear and simple style, this friendly book shows you how to meditate step by step. Each chapter is embellished by a meditation that enables the reader to reflect on, and experience what had been said. Stories and quotes bring home its relevance from ancient times to the present.